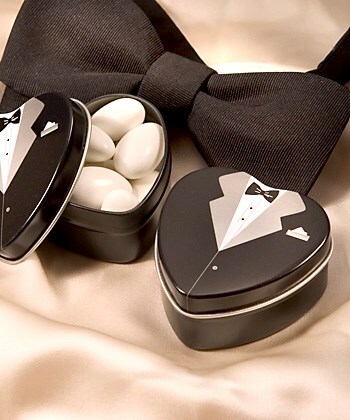 These metal tins with a classic tuxedo design are a stylish addition to your tables. Also sold in a complementary elegant wedding dress design, they're perfect to mix and match for all the ladies and gentlemen sharing in your special day. Each tin measures 2.25" by 1.125" and makes a useful and cheery container for any number of small treasures once your guests take them home.